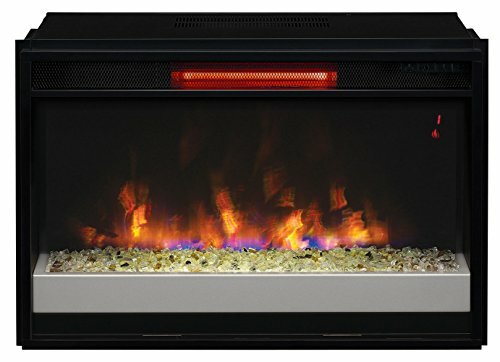 Welcome to our review of the five best electric fireplace inserts. Before we get much further along there are 3 critical things you must know, or determine about electric fireplace inserts. Get the exact measurements of your fireplace opening. Make sure your electric fireplace insert will fit. We cannot emphasize this enough. Some older fireplace openings might have odd measurements that do not fit standard inserts. In that case you may have to invest in or build a fireplace surround to cover up the space. These surrounds are available as accessories on many models. Determine the type of flame effects and ambience you prefer. Are you after a traditional looking fire that simulates realism as close as possible, or would you prefer something that has various flame color effects to set different moods? Are you being realistic on the inserts heating capacity? Most electric fireplaces can only be thought of as supplemental heat for a given room. This limitation is really not on the fireplace but on the capability of standard household electrical sockets and circuitry. 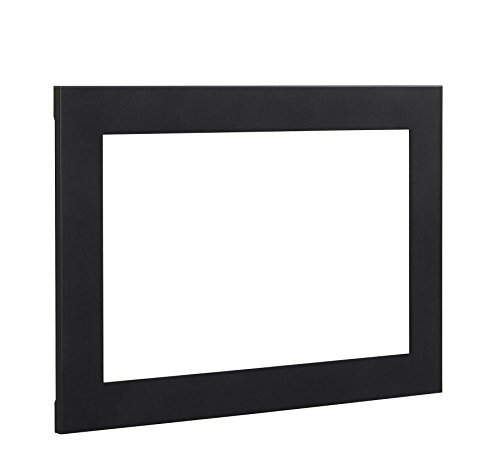 For more heating capability you may want to look at in infrared electric fireplace heater insert. What criteria did we use for our selections of the best electric fireplace inserts? The most important criteria we looked at was customer satisfaction. We also scoured the Amazon bestseller lists. We looked at pros and cons and came up with our determinations. Rest assured that you cannot really go wrong with any of the electric fireplace inserts on this list. Your selection will be a matter of taste, budget and whether the insert will fit your fireplace opening. The great variety of flame effects of this modern electric fireplace insert can generate is its primary strength. 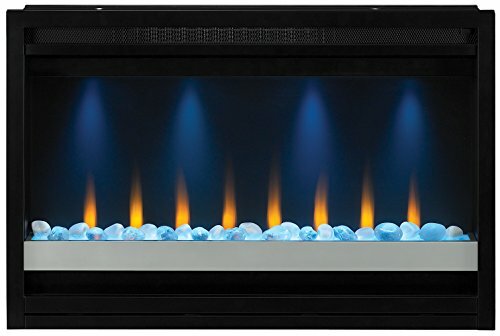 This ClassicFlame electric fireplace insert is great for those who want to have a lot of control over the colors of flame effects generated and the ambience they can bring to a given room. It features classic flames patented Spectrafire Plus flame effect technology. What that means in a nutshell is that you can select from five different color flame effects, several different intensities of light, and several different “speeds” of the burning embers. This allows for 125 select-able flame effect options. Most electric fireplaces claim to heat “up to 400 ft.²”. The maximum amount of BTUs they can usually generate is 5200. This model claims to heat up to 400 ft.² yet generates only 4600 BTUs. This leads us to speculate that even with limitations of electric fireplaces this may produce a little less heat than most people might anticipate. Flame effect can be operated with or without heat. The cost of operation becomes pennies a day without the heating function running. If you have young children or pets in your home then there is no need to be concerned for their safety as the glass at the front will not get hot. Amazon lists the measurements as 23.7 x 9.3 x 20 inches. This is actually the outside measurement of the narrow flange or lip that catches on the fireplace. The firebox unit itself has a listed dimension of 21.875″ W x 19.375″ H x 9.28″ D. While the listed dimension for the glass viewing area is 21.5″ W x 15.25″ H.
If this fireplace insert fits your fireplace, it could very well fit your needs. 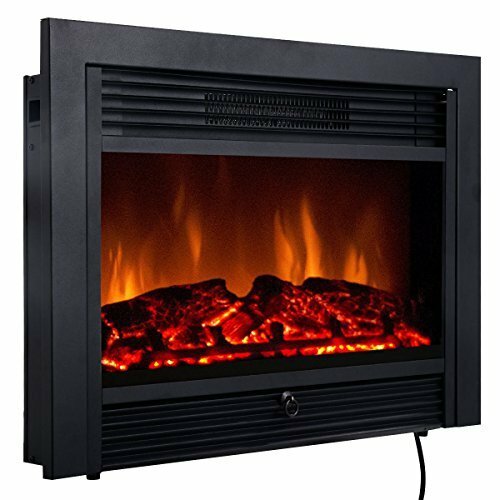 If you are looking for maximum control over coziness, ambience and flame effects this Classic Flame is one of the best modern electric fireplace inserts we have seen and has earned it’s place on our list of best rated electric fireplace inserts. Click for discounted price and more images. This is a very contemporary, modern infrared quartz fireplace. It comes with glass media rather than a log bed. You can change out the color of the glass bed to any color you like to match your decor. Be as creative and fashion forward as you like. You can purchase the same unit with logs instead of glass ember bed, but that is a special order from the manufacturer. This ClassicFlame electric fireplace insert is great for those who want to have a lot of control over the colors of flame effects generated and the ambience they can bring to a given room. It features ClassicFlame’s patented Spectrafire Plus flame effect technology. What that means in a nutshell is that you can select from five different color flame effects, five different intensities of light, and five different “speeds” of the burning embers. This allows for 125 select-able flame effect options. The burning embers and the flickering flames are powered by long life LED’s which are energy efficient and will not need replacement. Flame effect can be operated with or without heat. Most electric fireplaces claim to heat “up to 400 ft.²”. The maximum amount of BTUs they can usually generate is 5200 which is the output of this heater. The manufacturer claims it can provide supplemental zone heating for up to 1000 ft.². this is not the same as heating 1000 ft.². “Supplemental” means that it will raise the temperature a few degrees, not be a primary heat source. This is not a knock against this model it’s just the reality of the heating capabilities of electric fireplaces. This fireplace contains a fan forced wire element heater. The thermostat is adjustable by 2° increments. It runs with 12.5 A, 1500 Watts. If you have young children or pets in your home then there is no need to be concerned for their safety as the glass at the front will not get hot. The cost of operation becomes pennies a day without the heating function running. Amazon lists the measurements as 27 x 9.9 x 17.7 inches. This is actually the outside measurement of the narrow flange or lip that catches on the fireplace. There is a trim kit readily available for this insert for fitment issues. If this fireplace insert fits your fireplace, it could very well fit your needs. This is a modern electric fireplace and might not suit those who just want reular flame effects. 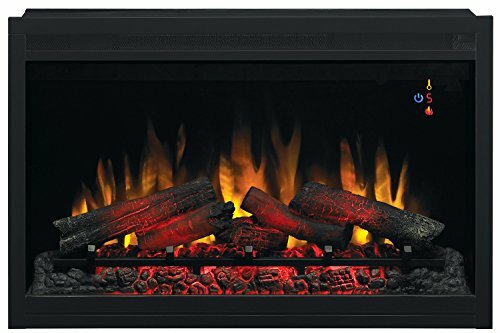 If you are looking for maximum control over coziness, ambience and flame effects this Classic Flame is one of the best contemporary, modern electric fireplace inserts we have seen and has earned it’s place on our list of best rated electric fireplace inserts. Click for more images and discounted price. The Giantex electric fireplace heater is simulating a natural fire effect. There are no fancy flame colors or effects. It has 2 settings high (bright and fast) and low (slower, not as bright). Most buyers were pleased with the flame effects and surprised at the quality at this price point. The flame effects were dinged by a couple of buyers one saying the ‘high’ setting was too bright and fast and they never use it. Another referred to the flames as ‘hokey’. Please take very careful note of the measurements and dimensions of this electric fireplace. Many buyers commented on the fact that it was smaller than they imagined. Most buyers had to modify or build a surround for the placement of the unit. Some people have used this unit in unconventional places due to its diminutive size.one person installed in a toy hauler, and another in an existing bookshelf. If a small sized,extremely budget friendly fireplace insert is what you’re looking for. This might fit the bill. We urge you in the strongest possible terms to click through, read more about it and see more images as well as paying attention to the dimensions. The great variety of flame effects of this traditional electric fireplace insert can generate is its primary strength. 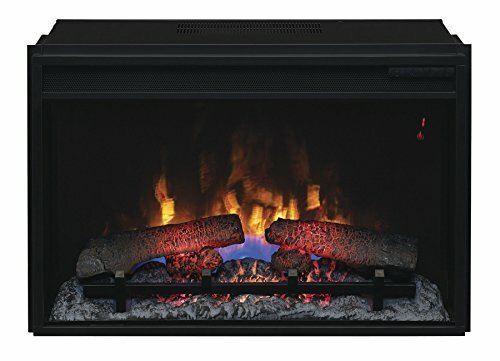 This ClassicFlame electric fireplace insert utilizes the same flame technology as the other 2 ClassicFlames on this list. It features classic flames patented Spectrafire Plus flame effect technology. Includes log set and pulsating, glowing ember bed. What that means in a nutshell is that you can select from five different color flame effects, several different intensities of light, and several different “speeds” of the burning embers. This allows for 125 select-able flame effect options. If you have young children or pets in your home then there is no need to be concerned for their safety as the glass at the front will not get hot. The burning embers and the flickering flames are powered by long life LED’s which are energy efficient and will not need replacement. Please Note: We are showing the classic traditional Model 36EB110-GRT. Most electric fireplaces claim to heat “up to 400 ft.²”. This fireplace is designed to provide supplemental heat for up to 400 sq ft. It is not infrared. The maximum amount of BTUs they can usually generate is listed as 4400, which is a bit less than most models in this class. Amazon lists the measurements as 36” W x 24” H x 7.62” D inches. This is actually the outside measurement of the narrow flange or lip that catches on the fireplace. That lip is 1.5 inches wide all the way around. The PuraFlame electric fireplace insert features 4 levels of flame with controllable variable intensity and brightness can be used with or without heat to set the ambience of any mood. Exceptional workmanship and precision detail make the PuraFlame Western a better buy than other similar products on the market. Downlight design increases the brightness of the hearth. The flame effects can be used without the heater being on. The embers glow different shades just like real coals, good looking flame with little hints of blue. Most customers are very pleased with the flame effects, especially at a distance. The log and glowing embers set up to evoke realism. The heating levels are controlled by electronic temperature control which gives more precise temperature control makes your room more comfortable. This is a front heat discharge unit. The heat is distributed through the vent located in the front and near the top of the black glass enclosure in blows forward. The noise level is low. It is commonly described as a low background hum, not disturbing at all. Maximum heating area: 400 square feet. There are 2 levels of heat – high which draws 1500 watts of power and low which draws 750 watts. For the technically orientated, the firebox maximum heat output: 1500W (4600BTU). 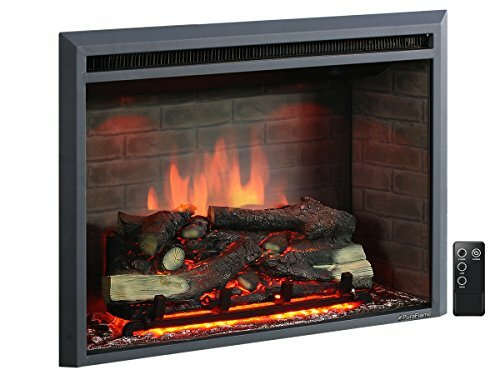 At he time of this writing this electric fireplace insert was listed as a ‘Best Seller’, and ‘Amazon Choice’ and a best seller from our site review. Summary – Which Of The Best Electric Fireplace Inserts Is For You? Well…it depends. Remember our #1 criteria – get the measurements and size right. The heating function on all these are roughly equal, with a slight nod to infrared models being a little stronger performers. The real difference is in the flame effects and ambiance options. If you are looking for jazzy flame effects (125 different ones), and great adjust-ability and of the ClassicFlame models will work well. They all share the same flame technology. Just search for and find the right size. For a more traditional flame look the PuraFlame models are wonderful and top notch. For a traditional look at a budget price – the Giantex may serve well. We hope this post on our 5 best electric fireplace inserts served you well. 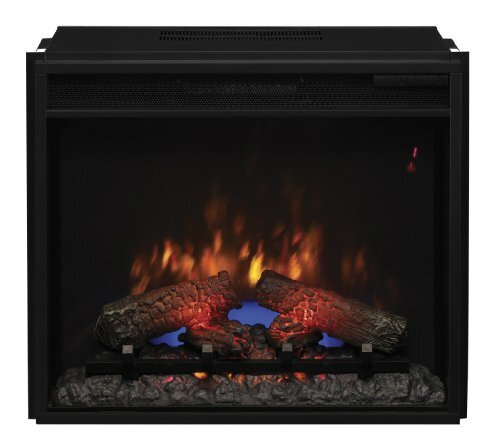 Click here for even more electric fireplace inserts.